There is something I love about Diary Of A Wimpy Kid more than anything. There are Movies to go with some of the books. I love that the kids and I, can read a book and watch a movie that goes with it afterwards. About this book: I loved it, as I have all the other books. There is not one page without a picture, so it will keep Zane interested. In fact, all the kids love the series. As a Mom, I like the way it is set up as there are just enough pictures to keep them interested and just enough words to make it a book. It still feels like a comic a little. This one Starts in the womb. Listening to his Mom talk while he was in the womb, Growing up with a live in family member and finding a date to the school dance is all part of Gregs life. Will he find a date? 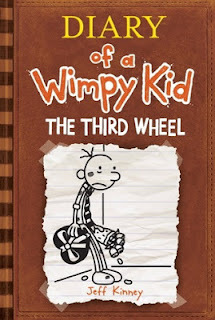 And how about Rowley? How who will he go to the dance with? Read it to find out. I think Zane will like that it does not stay on the same subject all through the book. You can read below to enter to win one of his books. Jeff Kinney has given me the chance to give one of his books to one lucky winner. He’d love to offer one of my readers a Wimpy Kid book of their choice from books one through seven! Thanks,Jeff for taking the time to write this series and give us the chance to help our kids enjoy a love of reading. I would get the do it yourself book for my son..he loves the wimpy kid books!